Start with a bang at METS – Marine Equipment Trade Show (Amsterdam, RAI, November 14th-16th, 2017). 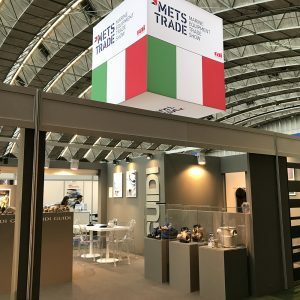 The stand (Europa Hall, 01.761) has seen a strong influx of professional operators interested in seeing the full Guidi production and establishing direct contact with the company. The 60 sqm exhibition area is characterized by the two major “strong” themes for Guidi: the product and the art. Alongside a the selection of their products, all made in Italy, Guidi exhibits a preview of the photographic book that will be published to celebrate the company’s 50th birthday in 2018: seventeen prints of pictures by the American photographer Jill Mathis, taken at some of the most prestigious Italian shipyards which have chosen Guidi as their supplier.